For example, if we’re honest, how many of us would admit to twinges of discouragement, disappointment, or even anger at statements on social media that seem dismissive, flippant or maybe even abusive? They may never have been intended that way. But, devoid of a significant person’s voice and presence, and accompanying body language, we’re left to interpret from one-dimensional communication a multi-dimensional message. The generally agreed upon “7 last words of Jesus” from the cross have the deepest significance when understood in the broader context in which and by whom they were spoken. To a group of men called out of their settled lives into the nomadic, unsettled life of Rabbinic apprentices, Jesus’ words already had weight. They may not always have understood. But they respected the source and therefore the words. But, remember that, by this point, they were busy licking their emotional wounds from having dismissed, betrayed, denied, disowned and finally abandoned him when he needed them most. They were literally swimming in grief and shame. Therefore, it was significant that the first words from Jesus’ mouth were not of condemnation as one might reasonably expect. No, they were of forgiveness. They are also of particular importance given the shady circumstances surrounding his death. Jesus had been handed over to be killed, not as a religious heretic or prophetic martyr, but as a political revolutionary. Jesus’ ignominious death was never really about blasphemy, or heresy as the religious leaders were fond of contending. Those were surface issues that made it easier to get rid of him. They were the straw man that became the elephant in the living room. Since we can’t seem to deal with this guy by theological means, let’s play the political card. Let’s throw him at Caesar and see what happens. Let’s appeal to the mass hysteria induced by authority figures telling people what they should be thinking about something. It was about a threat to power and control. He represented a genuine threat to the religious establishment. The cross tells us many, many things. It tells us firstly, that Jesus didn’t give up, either on his mission or on the first recipients of that mission. He saw it through to the end. Not just any end, but an ignominious end at the hands of his own people willingly handing him over as nothing more than troublemaker to the Roman powers-that-be. It also tells us that his own people distanced themselves from him spiritually by insisting on crucifixion as the means of his death; a form of torture reserved for enemies of the state, not the nation of Israel. That’s the context. “Father, forgive them, for they do not know what they are doing.” Under such shameful circumstances, no other words could possibly hold more powerful meaning. 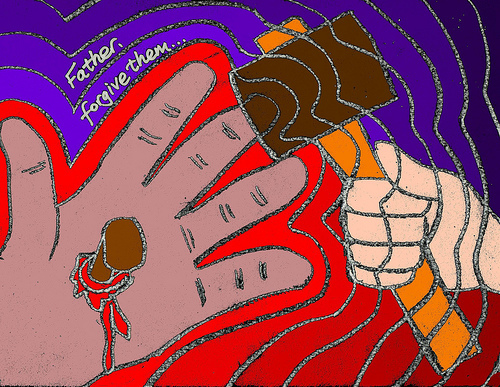 Before Jesus says, “It is finished” he says, “Father, forgive them.” We are drawn to faith not in the hope of forgiveness but in the reality of forgiveness. We rush into the arms of a God not waiting to forgive, but a God who has already forgiven. The first words from the cross frame all the rest. We do not have to assign any other significance to them because God himself is the one who has answered the cry of Jesus. Friends, forgiveness isn’t the end game of the cross. It’s the starting point. It isn’t the result. It’s the means of revealing a result. Our journey with God doesn’t come to a point of forgiveness. It begins there. Relationship doesn’t happen once forgiveness is offered. It can happen precisely BECAUSE forgiveness has been offered.